When you’re not feeling well, all you can think about is getting home. Our goal is to get you there as quickly as possible. Whether you’re recovering from a hospitalization, illness or injury, Good Shepherd ACE Headwaters Rehab has the skilled nursing and therapy care you require. We specialize in subacute care for patients who may not require long-term care. 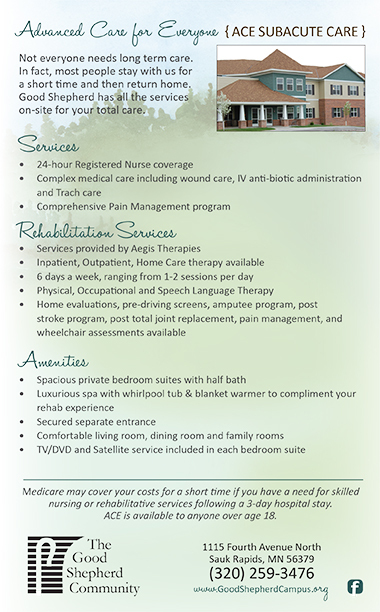 We provide in-patient, outpatient, and home care therapy provided by Aegis Therapies. Care includes minor to complex medical care from wound to tracheotomy services. Pain management, IV and antibiotic administration, and other critical services are available 24 hours a day and 7 days a week. Amazing amenities are also available in our comfortable setting such as private bedroom suites, spa with whirlpool tub, TV/DVD/Satellite services in every room, and many others. If you or a loved one is in need of subacute care, you can be sure that comfort, expertise, and caring are in large supply at ACE Rehab.